The guest house is fully air conditioned as are the rooms for adequate temperature control winter and summer. The room amenities are sourced from Just Pure and contains no synthetic fragrances or colours, no parabens or mineral oils and are not tested on animals. All our room amenities are for sale at Just Pure. The shop is located at the corner of Marine drive and Park - a mere 400m from 7 on Marine Boutique Guest House. The revolving artwork exhibited throughout the guest house are for sale from Rossouw Modern Gallery (3 Harbour Rd, Hermanus), just 700m from 7 on Marine Boutique Guest House. We source our fresh ground coffee from Beanery at Gateway Centre, Main Rd. (R43). The special coffee blend can be used with the clear dripper and filter papers provided in your room. Should you require assistance, please ask at Reception. You will find fresh milk in your room refrigerator. Breakfast at 7 On Marine is a delightful departure from the norm providing a mouth watering selection of tantalising dishes prepared for you by our resident chef. NOTHING is ever the same so expect something different each morning as you take in the views across Walker Bay. Menus are updated to ensure that seasonally available ingredients are included in the exciting selections available. Breakfast is served from 8-10 am daily. Breakfast packs for early departures can arranged at Reception on the preceding day. In case of an emergency, an emergency assembly point is located at the back of the parking area (north side/mountain side of the building). A second emergency assembly point is located on the grass across the road at the south/sea side of the building. Kindly familiarise yourself with the emergency exit routes as indicated in your room. 7 on Marine Boutique Guest House strives to minimise our environmental footprint as best we can. By reducing the bed linens and bath towels that are laundered every day, we can lessen the environmental impact. Your bed linen will be replaced every day only when the card provided in the room is placed on your bed. Towels will be changed only if they are placed in the bathtub. Your consideration will further reduce our carbon footprint by switching off your TV, vanity lights, heated towel rails and air conditioning units each time you leave our room. Extraction fans are installed in toilet cubicles that has no window. These are operated from a switch with a 0/1 indicator. All rooms are fitted with a fire detection system. In the case of fire in a room, a small fire extinguisher is provided inside the closet. Heated towel rails are provided to dry your clothes and towels. The heated towel rail is operated from the main rooms switch and has a indicator light to show when it is on. 7 on Marine Boutique Guest House is fully licenced and provides wine and beer at our honesty bar. Please write down what you take, your surname and room number in the book provided. The costs will be added to your bill to be settled upon departure. Ice is available in the freezer compartment of your room refrigerator or from the ice machine in the bar area. We make use of an external service provider to clean and iron your laundry if required. Please deliver your laundry bag to Reception by 8 am. Please note that same day service cannot be guaranteed. There is a small library of books available in the lounge on the 3rd floor along with binoculars & telescope for viewing whales and dolphins. Please pre-book lunch by 9 am and dinner by 2 pm at Reception. The guest car park is fully secure and gated. Access is by remote tagged access only. A security guard patrols the parking area by night. A platform lift is provided for the transport of disabled or mobility impaired guests and baggage. Do not attempt to use the platform lift in case of a fire. Kindly ask or assistance and instructions on the use of the platform lift from Reception. All rooms are equipped with a digital safe in the closet to store your valuables. Full operating instructions are provided in your room information folder. The sauna can be pre-booked at Reception. Kindly note that guests use the sauna at their own risk. All guests are kindly requested to wear suitable bathing attire when using the sauna facility. 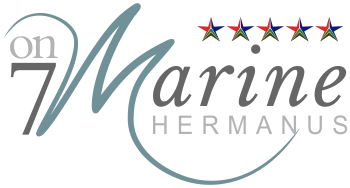 Hermanus is a historically low crime area and we have taken all necessary precautions to ensure the safety of guests and vehicles by way of secure gated parking, closed circuit cameras in strategic areas, remote access security locks on all entrances to the guest house and windows which provide a safety closing feature. You will be provided with a key and tag to the property allowing you access to the property upon checking in. These must be returned upon your departure from 7 On Marine Boutique Guest House. The use of the spa bath/Jacuzzi can be pre-booked at Reception. Kindly please shower prior to entering the spa bath/ Jacuzzi. All guests are requested to wear suitable bathing attire when using the spa bath/jacuzzi facility. Is prohibited inside the guest house. Please smoke in designated areas outside on the patios. The Samsung Smart TV is operated using the Samsung remote provided in all rooms. Selected satellite channels from Multichoice are available and can be browsed using the smaller DSTV remote. When leaving your room each time, please turn off the TV. The lights and demister of the vanity mirror above the wash basins can be switched on from the switch panel next to the door. Hermanus is a water scarce area & in keeping with an environmental awareness ethos we kindly request that you assist us in conserving this precious resource. Our tap water is of the highest quality and completely potable. Free Wi-Fi is provided. Please ask for the username and password at Reception. When the window handle is turned 180 degrees, the window is tilted open at the top in a secure position. Windows are fully opened by turning the handle 90 degrees. For your safety and security, please keep the windows in the closed or tilted position when not in your room.